Successfully Added LED Dog Collar (Red, Water Resistant, Ultra Durable) to your Shopping Cart. LED Dog Collar - the most convenient and stylish way to locate your canine friend in the dark. This convenient LED dog collar can be worn as a normal collar during day and turned on at night to keep your dog highly visible. The red LED light is easily visible up to hundreds of meters away and includes 3 modes (slow flashing, fast flashing, and constantly on) to make your dog extremely easy to find at night. This dog collar can be seen from all angles and is ideal for rural areas, camping, hiking, fishing, parks, outdoor events, jogging, bicycling, and even normal walks at night. This ergo-comfort LED dog collar is tough, yet flexible, and suitable for dogs of all sizes. The steel D-ring is large enough for virtually all leashes and strap adjustments take only a few seconds thanks to the quick release buckle. In addition, this dog collar is crafted from the highest-grade materials and certain to provide many years of service. As well as being water resistant, it is also made from an extremely durable nylon polymer webbing with a flexible, illuminating core in the center. 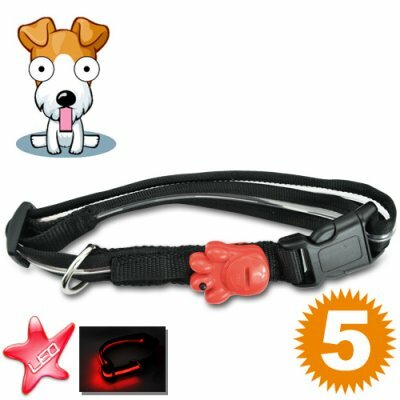 Protect and easily locate your canine friends with this red LED dog collar. Available in our warehouse now, order today and we'll express ship it out tomorrow. Brought to you by the leader in China Electronics - Chinavasion. What happens if I need more batteries for this LED dog collar? CR2032 batteries can be found at your local stationary store. You could also put in a request to our customer service team about a bulk order of batteries. Are there any other colors available for this dog collar, like a white LED? Not at the moment, but if you plan on making a bulk order (500+ pieces), feel free to contact our customer service team. Will my dog be able to chew through this LED dog collar? Nope, not only is it highly durable, but this dog collar is so comfortable your dog will love it too much to chew on it! this collar is fantastic, i purchased one for my mother who lives in the country and has a black dog, she no longer has to go out with the torch to find her dog. A great idea that should catch on soon i hope. Shipping time to nz was acceptable. thanks chinavasion.